Do you aspire to be a dean...? 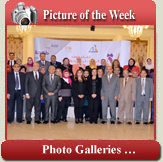 The Faculty of Early Childhood Education was established under the presidential decree No. 267 of 2006. The faculty comprises three academic departments: Department of Psychological Sciences, Department of Educational Sciences and Department of Basic Sciences. Welcome to the website of Faculty of Early Childhood Education. We hope we meet your needs of data and information. Also, we hope we highlight all related to the faculty and its different departments.